Africa’s rivers and lakes offer some of the finest freshwater fishing to be found anywhere in the world. We have great access to many of the best and stunning fishing locations Africa has to offer, giving any angler whether novice or advanced a truly magical experience! The Kavango and Zambezi is home to the incredible Tiger fish, Africa’s most exciting game fish that more than punches above its weight. Bream fishing is also excellent in these parts, as well as the vibrant Nembwe. Fly fishing is the most effective method for catching fish in these waters, providing the angler with hell bending battles. Likewise spinning is also very effective and an enjoyable way to hook up with some of Africa’s finest. The best time to fish these two systems is between August and December (although great fishing can be achieved all year round), when the receding flood waters from the surrounding plains fall back into the rivers, creating a concentration of baitfish. It is at this time where the annual catfish run occurs, which triggers a frantic Tiger fish bite, as aggressively feeding fish gorge themselves on fleeing bait fish, a spectacle in itself! Other species include, Three Spot Bream, Sharptooth Catfish, thin face large mouth and many more! We also offer Fly Fishing in South Africa – the diverse and unique highland rivers and lakes in this glorious country will take your breath away. Here you can stalk wild brown trout in crystal-clear mountain streams, a fishing paradise even for well-travelled hands. We also specialise in Nile Perch fishing, for those who want to test themselves against the sheer muscle and size of these true African monsters! 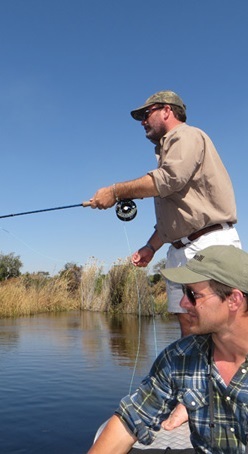 Here at Soren Lindstrom’s Africa we are all passionate anglers with a love for the sport and the incredible surrounding wildlife, so please come and join us for an unforgettable fishing adventure!